It was quite a mass of jersey-wearing humanity that descended large and early on Near Southeast this morning for the NHL Winter Classic. The crowds on Half Street even by 11 am were huge, and the local beverage establishments were doing big business as well. So of course I wandered around with my camera to get some photos of the feel around Nats Park on this beautiful and crisp first day of 2015, and the shots confirm the size of the throngs, and that most everyone was indeed Rocking the Red. Could a victory propel an evening of revelry in the neighborhood? We shall see! Go browse the gallery to see them all. While tickets aren't easy to come by without a sizeable wad of cash, there will be events around the neighborhood where the both lucky ticket holders and unlucky ticket unholders can congregate before, during, and after the game. * OFFICIAL FAN FESTIVAL: As mentioned previously, the official SPECTATOR PLAZA PRESENTED BY GEICO will be set up at the Fairgrounds at Half and M streets, SE, from 9 am until 1 pm, with all manner of attractions, prizes, food, music, and purchasing opportunities. * ROCK THE RIVERFRONT: Starting at 10 am and running until 7 pm, Canal Park will celebrate the Winter Classic with its own free "Rock the Riverfront" festival, with CBS radio station 106.7 The Fan broadcasting live from the roof of the Park Tavern before and after the game. There will be live music, beer from DC Brau, food, ice skating (natch), former Caps players (including Dave Christian), and more. And the game will be broadcast on multiple TV screens. * OTHER VENUES: Willie's will open at 8:30 am, the Big Stick at 9 am, Bluejacket at 10 am, Justin's Cafe at 11, and Biersch at 1 pm (because of a private event earlier in the day)--the Post's Going Out Guide has more on what these places will be offering. And of course my Food Options map gives you the complete lineup of eateries and drinkeries in the area. * CAPS MASS: St, Vincent de Paul church at South Capitol and M SE is providing a special Winter Classic Caps Mass at 11:30 am. * BIKESHARE: (ADDED) There's going to be a corral from 11:30 am until 30 minutes after the game at the dock at 1st and N SE. * ROAD CLOSURES: MPD has announced road closures from 8:30 am until approximately 6:30 pm, including Potomac Avenue south of the ballpark, 1st Street south of M, N Street from South Capitol to Tingey, and Half, Van, and Cushing (?) between M and N.
* PARKING: Even though it will be New Year's Day, don't be thinking you can park free and clear on the streets in the neighborhood: DPW has announced that residential parking restrictions will be enforced. My map of close-by parking lots should be relatively accurate in terms of locations, though probably not prices. UPDATE: However, apparently meters will not be enforced. * NOON YARDS EVE: On Wednesday, Dec. 31, from 10 am to 1 pm there's the free Noon Yards Eve. Billed as "a fun daytime New Year's Eve celebration for the family and children," it will feature a big countdown and balloon drop at noon, along with lots of activities for the kids and a "trackless train ride" through Yards Park. A press release today gives official details on the SPECTATOR PLAZA PRESENTED BY GEICO that is going to be set up at the Fairgrounds on Half Street during the hours leading up to the NHL Winter Classic® at Nats Park on Thursday, Jan. 1. From 9 am until 1 pm, the Fairgrounds "will transform into a hockey and entertainment festival" with "live musical performances, interactive hockey-themed attractions, prizes and giveaways, food and beverages and retail tents with an extensive selection of of officially licensed 2015 Bridgestone NHL Winter Classic® merchandise and collectibles." The event's sponsors are definitely pulling out all stops for the Fairgrounds offerings. I started to include the highlights, but I got worn out at the length and breadth--so read the press release to find out what is being offered by Bridgestone, GEICO, Reebok-CCM, Oscar Mayer, Honda, Enterprise, McDonald's, Miller-Coors, York Heating and Air Conditioning, Ticketmaster, AMP, and various other NHL-related offerings. It's all free and open to the public. And then there's the game itself, between the Caps and the Blackhawks, at 1 pm. * VET HOSPITAL PERMITTED: An approved building permit made it through the pipeline on Thursday for the "construction of a new pet veterinary boarding hospital and vet uses" at Twelve12 in the Yards. There has as yet been no official announcement from Forest City as to the name of the operator, but this new retail offering was telegraphed thanks to some necessary zoning reworkings earlier this year. Look for a lot of pet traffic along Tingey Street between this store and the still-as-yet-not-officially-announced Unleashed by Petco that got its building permit for a space in the Boilermaker Shops earlier this month. UPDATE: A reader reports that promotional signage on Half Street by Nats Park showing the neighborhood's offerings does let the cat out of the bag, that it's going to be a Banfield Pet Hospital. * CLASSIC UNVEILED: The publicity machine for the NHL Winter Classic at Nats Park on Jan. 1 is beginning to ramp up, with the official announcement (finally) of the game, alongside the unveiling of the Capitals' throwback jerseys, which begat lots of photos of somewhat uncomfortable looking hockey players at the ballpark. There was also the cool outline of where the rink will be set up. * RAMP REOPENED: This week saw the reopening of the new-ish ramp from 11th Street SE to the westbound SE Freeway/I-695. It had been closed down in June to allow for demolition of the old flyover exit ramp from the inbound freeway to I Street SE. And some day I will actually get over there again to check it all out. * TRAILER PARKED: A few readers have passed along the news that a construction trailer has appeared within the past week or so on the Florida Rock site along the Anacostia River just south of the ballpark. While plans are to get underway Any Minute Now on the first-phase 350-unit apartment building at the site's eastern end, next to Diamond Teague Park and Piers, there's not yet been any news that the construction financing has been finalized, nor is there as yet an approved shoring/sheeting/excavation permit. But the time does appear to be drawing nigh that development of this 5.8-acre parcel will finally get underway, at which point people will shift from complaining about the empty lot right across from the ballpark to complaining about a tall building ruining the views of the river. The Washington Post is reporting this afternoon that hockey is coming to Nationals Park in a few months: "The NHL and the Washington Nationals have reached terms allowing the 2015 Winter Classic game, set for Jan. 1 between the Capitals and Chicago Blackhawks, to be played in the D.C. ballpark, according to three people familiar with the negotiations." It was announced almost a year ago that the game would be coming to DC, and there were "reports" in December of 2013 that the ballpark had been chosen as the location, but apparently there were "several issues" needing to be resolved. An official announcement is expected "very soon," says the Post. It's been a long road to this, with rumors first flying back in 2010 that the Winter Classic would come to Nats Park in 2011. Now let's hope it's not 70 and sunny on Jan. 1. I hate writing a post that's based on "a source" telling a news outlet something, but I would be remiss if I ignored that "The 2015 Winter Classic will more than likely be staged at Nationals Park, a source told ESPN.com on Monday." It was announced in September that the Capitals would be hosting the 2015 incarnation, but officials had been checking out RFK Stadium and FedEx Field in addition to Nats Park. UPDATE: And now WaPo weighs in with its own "The 2015 NHL Winter Classic will likely be held at Nationals Park in Southeast Washington, according to a person with knowledge of the situation." 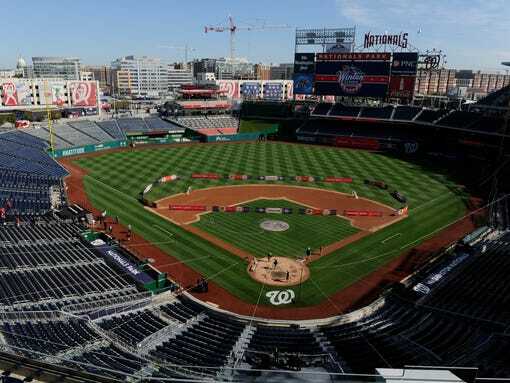 "Another advocate for a D.C. venue is Nationals President Stan Kasten, who confirmed his team is prepared to make a hard charge to put on the Winter Classic. That aggressive bid will be led by Mark Lerner, a minority owner of the Capitals whose family owns the Nationals. Kasten said the Nationals have already made a detailed presentation to the NHL, complete with schematics showing where the rink would be placed. Kasten also said officials from the league paid Nationals Park a visit earlier this year when Washington was being considered for the 2011 game. "'Let's face it, Nationals Park is the premier venue in the most important city in the world,' Kasten said. 'I can't imagine it being anywhere but Nationals Park.'" The article also quotes NHL league commissioner Gary Bettman, on being asked if the connection of Nationals owner Mark Lerner to the Capitals (he's a minority owner) helps the case for Nats Park: "It certainly doesn't hurt." The article does say, though, that the NHL prefers football stadiums, since they can hold more fans. Nationals Park would hold about 42,000, while FedEx Field has nearly 92,000 seats for Redskins games. * In Senate testimony, US DOT secretary Ray LaHood used "the area around the ballpark" as an example of "livability" during a sharp exchange with Sen. Kit Bond. You can see the video here (skip to the 92-minute mark), or read the story about LaHood's testimony on Streetsblog. * The ANC 6D meeting tonight is at the Courtyard in Near SE, but SWDC Blog posted photos of the commission's new digs in the about-to-open Waterfront development. * WashCycle thinks that the 10-block temporary tunnel CSX says it will build on Virginia Avenue when reconstructing the existing tunnel ought to be kept for bike/pedestrian use ("lighting would have to be a must", they say). DC Council to NHL: Pick Us! Pick Us! Taking a stand for hockey fans all across the DC Metro area, Ward 4 council member Muriel Bowser introduced at Tuesday's council meeting PR18-0761, "Sense of the Council that the District Of Columbia Should Host the 4th Annual NHL Winter Classic Resolution of 2010." The resolution, which garnered the support of all 13 council members, was in response to the rumors that started flying last month that the NHL is poised to name Washington as the location of the 2011 edition of the now-traditional game played outdoors on New Year's Day. There could be quite a melee to get tickets if the game does come to DC--307,000 people applied for tickets to the 2010 edition at Fenway, and the Capitals now have the highest attendance rating in the NHL--which, for someone who used to traipse out to the Cap Centre in the 1980s to see the Capitals flounder around in front of a few thousand people, is still rather astonishing. UPDATE: Though some commentators are questioning the council's "highest attendance rating" claim. No word on when the NHL will announce the city and teams chosen for the game.